IndiansinKuwait.com - Check your price tag. Beware of offers! Check your price tag. Beware of offers! One after the other offers and discount sales are running in most of the showrooms and super markets across Kuwait. People are always attracted to the word "Sale" which varies from 50 to 75 percent! But how many of us really care to check what price we are paying at the counter of these shops? One of the customer narrates her experience of how customers are taken for granted at one of the major shopping centres in Kuwait during their recent sale period. 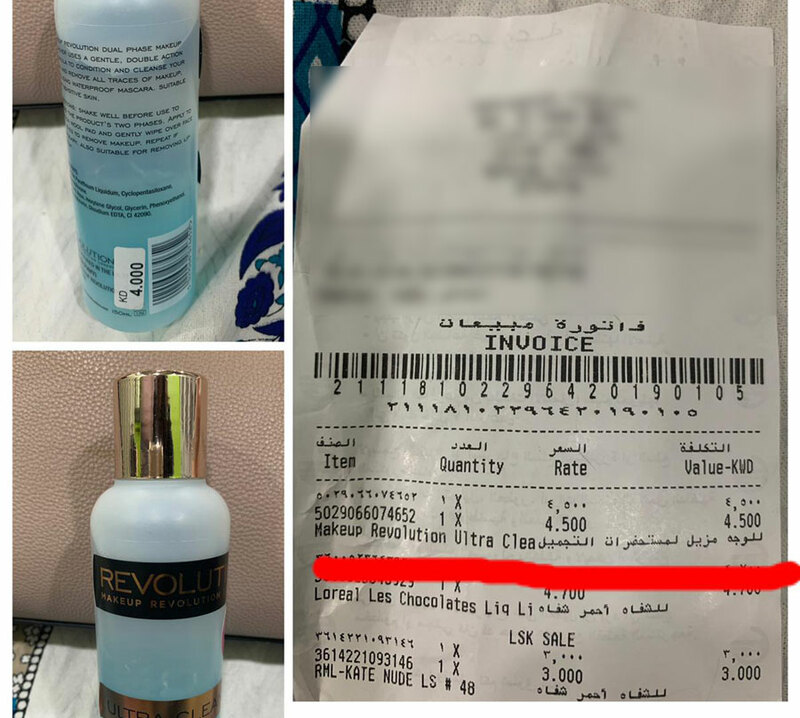 The customer who bought a Make Up remover from a famous showroom at their Salmiya branch located at Salem Al Mubarak Street, was originally priced at 4.000 KD and offered at a discounted price of 3.400 Kd. Later at home while the customer was checking the invoice, it was noticed that the same item was charged at 4.500 KD. The customer went back to the store to enquire about the mistake and the store officials politely apologised for the system error and returned the excess amount charged. In a normal scenario, a shopper will take it as a system error and the story will end there. 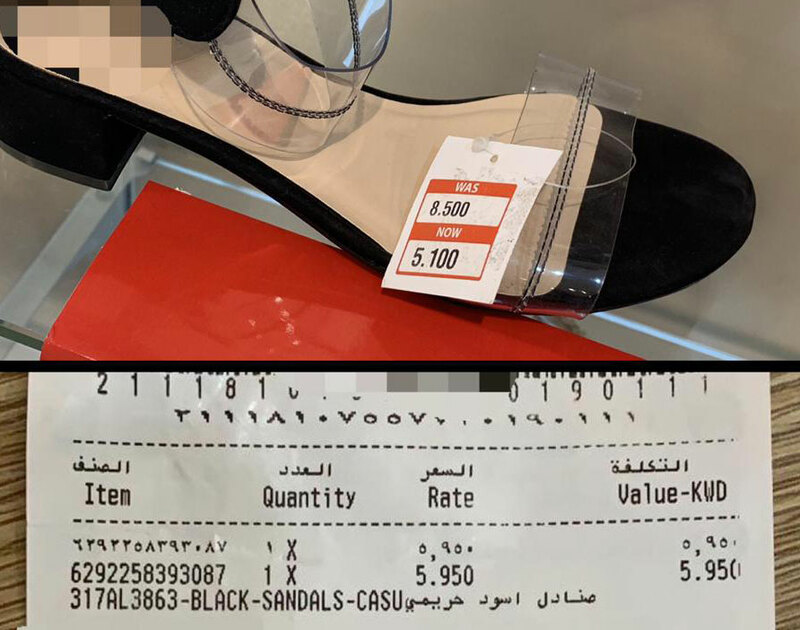 But surprisingly, the same customer happened to visit Al Rai showroom of the same store to buy a pair of sandals which was priced differently at Salmiya outlet. The sandal which was priced at KD 5.100 was billed as KD 5.950 in the invoice! Sensing the cheating, the same customer went to another branch of the same store at Grand Avenues to experience the same story. A Ladies top which was on offer for 2.900 KD was billed as 5.000 KD at the counter!! "After a series of debate with the store people, I finally met the higher management of the store. They realized they were guilty and they agreed to go through their system to correct any price discrepancies in future. But what about the large number of people who had already made their purchases at these stores?" asked the customer. If this has been the experience of an alert customer, how many more have been made victims to this unethical negligence. How many of us really check the price we pay at the counter for each item and cross check with the price tags on the items? Even if we notice such discrepancies when we are buying only a few items, we all must have settled it there itself with their 'Sorry, a system error' kind of response. Is it really a “chance system error” if it has been happening for a long time!!!!! Teh Tag itself show which Brand,so need of Name ok. The same thing happened to me while shopping an old hypermarket in al rai. There was an offer for the box of 100 pcs of 10gm butter in the prices slashed from KD 3.300 to KD 1.800 but in the billing counter they had charged me the same original amount. Many of my friends also got fooled for the same reason in the same hypermarket while purchasing towels and other items. Nowadays many of my friends including myself have stopped going to that hypermarket or to any of their branches. So irrespective of teh shop, next time when buying items from any shop, make sure that the price in tag and that on invoice are same. U must put down the name of the shop! why worry when you are right! if they are cheating ppl in day light they should be exposed as well. it is understandable if it was an error and u do not disclose the name of the retailer. but this is smart robbery! I also experienced the same from this same shop. This shop is in Salmiya opposite Al Fanar Mall. Two time I faced this same issue during sale time. I was thinking it is a mistake due to large crowd during sale. Now understood it is their tactics. I want to share my personal experience related to it, a well known hypermarket in Kuwait given very good advertisement in flyer and distribute all area of Kuwait, but when i visited to purchased that item, it was not available asking to manager said it is a typing error in the flyer and said sorry and closed the matter but at last i dont have option to buy that item on higher price as i visited and travel a long distance, so such type of words are very common saying sorry and error in system and typing. This happened to me in the most famous electronics seller chain in Kuwait. I bought a Sennheiser basic headset which was on sale @4KD (price tag displayed in store) and when I checked the bill later, it was billed @4.9KD. I should''ve returned to the store and informed them like this lady did. But unfortunately I didn''t! This is not a mistake but a deliberate attempt to cheat customers. so in this case chamber of commerce should cancelled their licence of trading and insert them in jail for 6 months. Selling Used, Refurbished, First Quality Copy, FAKE As New in Kuwait Market. Dear Visitors, always try to buy expensive devices only from Reliable Shops in Kuwait. Don''t try to buy any items which are advertised in Facebook or Social Media. Sometimes we need to get some old models, which is not available in many shops, so people are trying to search for other resources. Most of them are cheaters and no valid shops, no valid warranty, they are selling Used, Refurbished, First Quality Copy or Fake items As “Brand New”. Very hard to identify item quality, so don''t choose them, even if they try to sell as very low prices. Especially on Mobile Devices. When the system error occurs which make lose to company, the company will terminate the people behind the system error, so in this case also company should do the same. We had same experience with many shops in Kuwait. Now a days when they are billing we are watching it. Otherwise no other way to protect us. I have seen many times the same issue. It seems the shops are doing it intentionally. This happens to be a normal thing now in Kuwait.. I had many such experience.. Recently I was purchasing from one of the showroom in Kuwait, I took some items which shown on sale on their stall, but not on the Promotion Catalog. I was confused with the price and checked their price on the Bar code reader.. They found to be not in Sale. I complained to the salesman, and he told me sale was there before one week and no more now. I warned him, in that case take out those items from that place and remove their sale tags.. Then he laughed and said, they purposely did this, some people really don''''t check its price, they just look the sale tag only..
#Metogotcheated. other hyper do the same. please some guide us all how to handle these situation legally. system error is simple answer from them. system can''t make mistake by itself. system will give output based on what ever data loaded. it is clearly a cheating. I think, the above is about the same shop in salmiya where I also got cheated. Two weeks back, there was a sale in this particular store in Salmiya. I bought a ladies top, which was originally 6 kd and on offer 3.400 kd. I bought few other items also. Once I reach home, I was checking the bill and found that they charged 6 kd for that top instead of sale price 3.4 kd. I thought that was a mistake and ignored it as I couldn''t go to the same shop again due to my working hours.. Now I realized that it is their trick!!! Yes, many a times this was happening either Super/Hyper or sales .When we buy Grocery items in Hyper market or any Super market in Fahaheel please check your voucher before you leave the counter. one example was when we bought 1kg Onion while the price was slashed we did not realise that they had charged us for 10kg,self ignorantly paid by KNET but when we came to our car we noticed that the voucher showed 10kg immediately went to the sales person where paid the bill.He simply said Sorry and refunded. Yes absolutely , i got the same experience at a very famous hypermarket last week there are many items displayed 1 item 1 free and 2 item 1 free, so accordingly we purchased many of them but at the cash counter they have charged us for many items which suppose to be free, then after I reached home i checked one by one and return back to the Hypermarket and claimed many and got the cash vouchers for the same not liquid cash, here also we got cheated if it is liquid cash we can buy again 1 +_ 1 free but when they provided cash voucher we can buy only one item for the amount, so guys take care always at the cash counter even its a big SALE. None of these shops or super/hyper markets are there for charity. If there is sale, it is to clear some old stick with minor damage which you will hardly notice. Otherwise the old formula, keep the prices elevated and then provide discount. How many of us can remember actual / normal prices of several items across so many stores? quite difficult. So just be more wise during sale season and have a watchful eye when they bill the items. In some supermarkets like Lulu, there are bar code scanners installed in many places inside the store. So you can scan the item yourself to make sure that price on the system is correct. The same thing happened for me from One Indian Store In Dajeej , For Galaxy sweets . They mentioned offer price as .875 but they are charging 1.350 /packet. 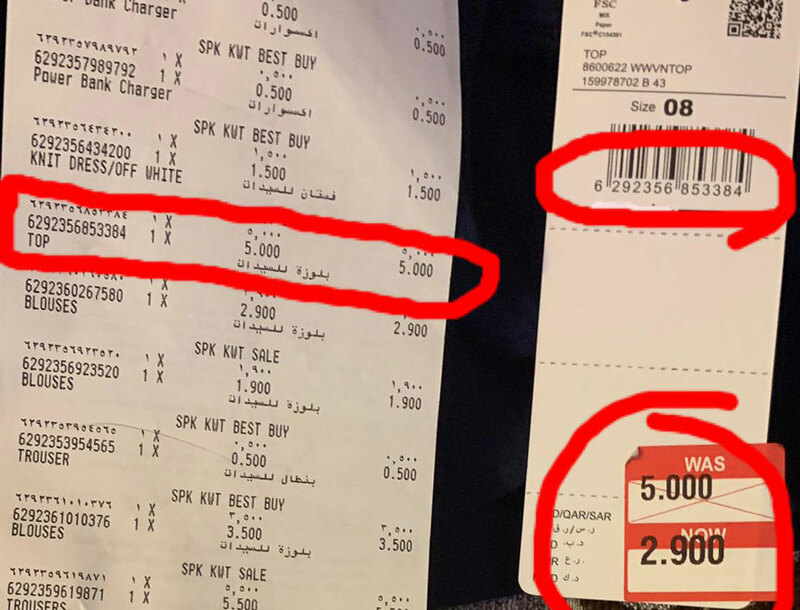 Yes, This is quite same for almost all stores, supermarkets, even branded showrooms here in Kuwait, all price discrepancies are called "Sorry, it is system error, or price changed after the stock provided for sale" when we found the over charged. I have so many bad experiences, so now i am checking prices for the doubtful items prior to billing and now used to tell my wife and son to check the monitor while billing, as they also have same bad experiences. Good thing is now some stores are provided with barcode scanners available for customers for checking prices. Even though the "Sale" is the right time to shop for getting the right price for items. Its better to use a calculator. The moment you put an item in the trolley- add the amount and keep adding and compare the total amount you pay. i know its not easy but try this method once in a while. same thing happened to me at one showroom and they refused to return my money back but they offered me a voucher against it to purchase something else, once i said i will go to the higher management, then they called somebody and gave me my money back. Yes it happens many times...even in supermarkets. I have also experienced such incident many times and from that time I always check the bill before I leave the shop. Thank at least someone bought it up. I have a same bad that time they said same excuse. Next time the same thing happened, I questioned they blamed the person who put price tag on the cloth. But this time I told them need to talk to the Floor Manager and he came and apologize. The sad part is everyone around me looking like an alien. Most of the goods sold at discount are old stock. Even Food stuff like Fish & Mutton are stale in may super markets. Complaint doesnot work as one Hypermarket request nationality even for sending mails and there is no reply if it is expartiate. Yes, it happened with me once. I was buying only one particular item so I could easily identify the price difference in billing and on display. But If we are buying 5 to 10 item, no body will notice these type of cheating. We never check the invoice how much it is charged! God only knows how many are cheated!